Minibrix is a Lego-like system of interlocking rubber bricks. While quite popular in the 1950s, they are now virtually unknown. Minibrix were designed as a toy for constructing miniature houses and other buildings. 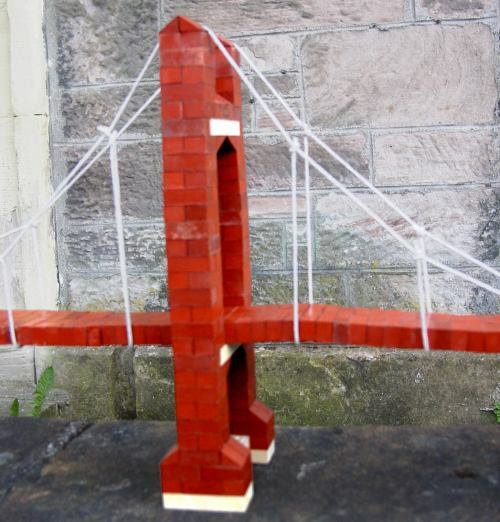 However, it turns out that they are ideally suited to bridge-building. Metal toys like Meccano or plastic toys like Lego are supernaturally strong at model scales. The heavy and flexible rubber bricks make Minibrix significantly weaker, much like the steel of a larger structure. 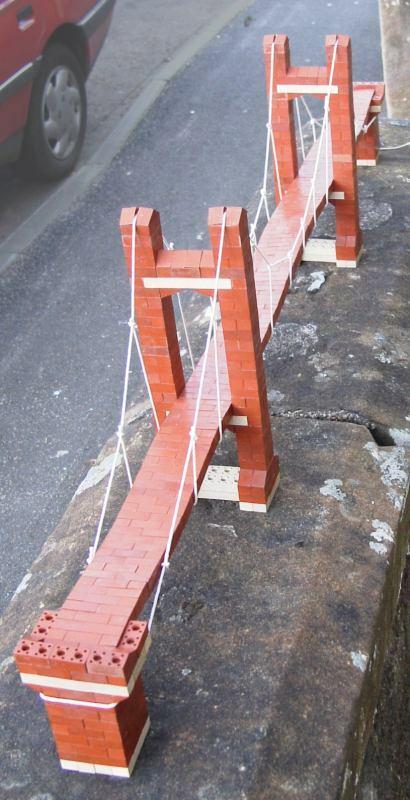 This page contains photographs of a four-foot long suspension bridge which was designed and built with the help of Chris and Michelle. We found it quite difficult to get the roadbed flat over its length. Shortening a cable to raise the road in one place results in the road dipping in other places. Rather challenging. Fortunately we didn't have any dynamic loads to contend with (such as Tacoma Narrows). 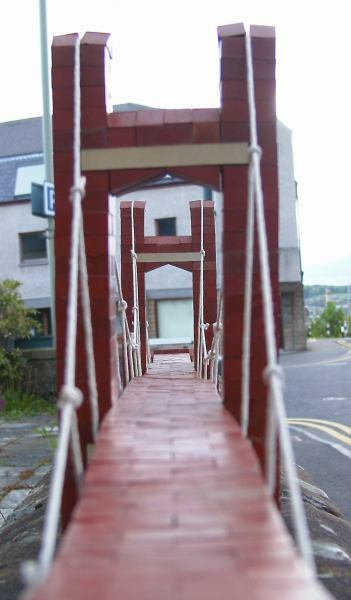 I doubt any of us will look at a suspension bridge in quite the same way again. Construction Notes: Here are some simple schematics of the towers and the abutments. One standard brick measures 3/8" tall, 1/2" wide and 1" long. The roadbed was 123 bricks long. Since the bricks in the roadbed were at 90° to the rest of the structure, they never interlocked with anything. To give added stability, the abutments were solid, not hollow.